“Because Scott Walker Asked”: Leaked Docs Suggest Wisconsin Gov Illegally Raised Corporate Donations | Democracy Now! chief reporter for The Guardian US. JUAN GONZÁLEZ: We begin today’s show with an explosive new report that reveals the extensive influence of corporate cash in U.S. elections through third-party groups that do not have to disclose their donors. The report published by The Guardian is based on 1,500 leaked court documents from an investigation by Wisconsin prosecutors into possible illegal fundraising by Governor Scott Walker for the third-party group Wisconsin Club for Growth, a 501(c)(4) organization. Prosecutors gathered hundreds of email messages that show exchanges between Walker, his top aides, conservative lobbyists and leading Republican figures such as Karl Rove. Now-Republican presidential candidate Donald Trump also appears in the files from when he met with Walker and then donated $15,000 to the Wisconsin Club for Growth. But last July, a conservative majority of Wisconsin’s Supreme Court halted the prosecutors’ investigation before any charges were filed. They said prosecutors had misread campaign finance law and that their targets were, quote, “wholly innocent of any wrongdoing.” The justices also ordered that all evidence from the investigation should be destroyed. But at least one copy survived and was leaked to The Guardian. AMY GOODMAN: This is how reporter Ed Pilkington begins his report: quote, “Scott Walker was under pressure. It was September 2011, and earlier that year the first-term governor had turned himself into the poster boy of hardline Republican politics by passing the notorious anti-union measure Act 10, stripping public sector unions of collective bargaining rights. “Now he was under attack himself, pursued by progressive groups who planned revenge by forcing him into a recall election. His job was on the line. “He asked his main fundraiser, Kate Doner, to write him a briefing note on how they could raise enough money to win the election. At 6.39am on a Wednesday, she fired off an email to Walker and his top advisers flagged 'red'. “Her advice must have hit a sweet spot, because money was soon pouring in from big corporations and mega-wealthy individuals from across the nation. A few months after the memo, Adelson, a Las Vegas casino magnate who Forbes estimates has a personal fortune of $26bn, was to wire a donation of $200,000 for the cause. “Adelson’s generosity, like that of most of the other major donors solicited by Walker and crew, was made out not to the governor’s own personal campaign committee but to a third-party group that did not have to disclose its donors. In the world of campaign finance, the group was known as a 'dark money' organisation, as it was the recipient of a secret flow of funds that the public knew nothing about. One of the checks made out to the group, for $10,000, came from a financier called G Frederick Kasten Jr. In the subject line of the check, Kasten had written in his own hand: 'Because Scott Walker asked'. Welcome to Democracy Now! It’s great to be with you again. Ed, explain the significance of this and how you got these leaked 1,500 documents. ED PILKINGTON: Well, I’m not going to discuss how I got the documents. You’ll understand that. We’re not talking about anything to do with sources, and which is a relevant matter today because in Wisconsin they are talking about launching a leak inquiry. The attorney general of Wisconsin has said he will consider appointing a special prosecutor himself to go after the source of these documents. So, it’s a sensitive and important issue, and one we’re being very clear on: We’re not going to discuss anything to do with sources. But what we think we saw in these 1,500 pages of documents that we received is not only a very intense story about Wisconsin, which is a noble state with a very long tradition of very progressive politics, that has become, I think, a kind of ground zero of the battles, partisan battles, between left and right, ever since Scott Walker became governor in early 2011 and introduced this union-bashing law, Act 10, but it also tells us—and this is what we tried to focus on at The Guardian—it tells us a much wider picture of what’s happening right across the nation, which is all about, I think, the atmosphere and the environment created by Citizens United, the Supreme Court ruling of 2010, in which it seems to be that politicians, senior politicians around the country, are interpreting the ruling almost as anything goes. They’re entitled now to do pretty much anything. They can attract millions of dollars of funding from the top billionaires right across the country. They can channel it through these dark money groups, which do not—have no limits on how much they can collect, do not disclose their donations to the public, and go that way in order to—what the prosecutors alleged in Wisconsin—to circumvent campaign finance law to the detriment of the public, because the public doesn’t know that this stuff is going on. JUAN GONZÁLEZ: And, Ed Pilkington, in your story, you note not only that these justices in Wisconsin decided there was no crime here that needed to be a prosecuted, but also that they, one, ordered the destruction of the documents, and, two, that some of these very justices had been re-elected as a result of dark money contributions to them. ED PILKINGTON: That’s right. You know, once one delves into the documents and into the story, you find yourself going into a sort of vortex of ever-tightening circles, where everyone seems to be talking to everybody else. And again, we saw that as a sort of metaphor for what’s happening across the country. We focused on one justice of Wisconsin’s Supreme Court called David Prosser, who has in fact just retired, but he was re-elected in 2011. And he himself drew upon the support of millions of dollars of corporate money, pushed through exactly the same third-party groups that then went on, at the same time, to help Republican senators, and then Scott Walker himself, go through their recall elections. Now, the John Doe investigation that created all this evidence, that is the documents we received, was looking into exactly those groups, right? The Supreme Court of Wisconsin ordered the documents in which this material is contained to be destroyed. And yet, in the documents is evidence that the same groups were supporting one of those justices on the Supreme Court of Wisconsin in his own re-election. So, as I say, you find yourself going in ever-tighter circles, and you kind of wonder: You know, where is the sort of openness? Where is the transparency? Where is the being honest with the Wisconsin public about what is going on here? AMY GOODMAN: We’re going to go to break and then come back to this discussion. We’ll also be joined also by John Nichols of The Nation in Madison, Wisconsin. These are astounding leaked documents, an explosive new report by Ed Pilkington, chief reporter for The Guardian US. We will link to his piece, “Because Scott Walker Asked.” But we’re going to talk with him further about it in a moment. JUAN GONZÁLEZ: Well, at a press conference on Thursday, Wisconsin Governor Scott Walker said he’ll leave an investigation into the John Doe documents leak to legal authorities. GOV. SCOTT WALKER: We’ve been scrutinized more than any elected official in America. And we’ve had several courts, not just one, including a local circuit court judge, that was reserve judge, well respected, just over in Eau Claire County, who, to my knowledge, is not aligned politically with anyone, has shut down this baseless investigation multiple times. And we’ve seen it through various courts. And what you have are people who’ve failed to win in a court of law because their arguments were baseless when it comes to law, now trying to selectively put out bits and pieces of information to try and win in the court of public opinion. But they’re doing it without context. So, we’re going to abide by what was requested in the first place by the legal system, which was not to comment on those things until they’re fully resolved. And there’s still one more quest in terms of the U.S. Supreme Court that they’re going to; we don’t think it’s likely that they’ll get traction there. But it is frustrating when it’s been time and time shut down by the courts. JUAN GONZÁLEZ: That was Wisconsin Governor Scott Walker speaking on Thursday. We’re speaking here with the chief reporter for The Guardian, the U.S. author of a new—explosive new report called “Because Scott Walker Asked.” Ed Pilkington, I wanted to ask you not only to respond to what Walker said, but also, if you could, one of the people you mentioned in your article was Harold Simmons and his company NL Industries—if you could talk about their role and what you found? ED PILKINGTON: Yes. I mean, at the heart of most campaign finance law is the fear that unless you protect—unless there is some degree of regulation, there could be quid pro quo, literally, this for that, or you scratch my back, I’ll scratch yours. And in the documents, there is some suggestion that at least even the appearance of quid pro quo could be there. And the Supreme Court of the United States has made it clear very many times that even appearance of quid pro quo must be avoided. JUAN GONZÁLEZ: And Harold Simmons’s connection to lead paint? ED PILKINGTON: Harold Simmons owned a company called NL Industries, historically National Lead Industries. They were one of the biggest manufacturers of lead paint until lead paint was banned in 1978. And if the law had not been stopped by the federal courts, as it was, the law—the legal changes that the Republicans made in the Legislature, it would have been virtually impossible for children damaged by lead paint—as you know, it affects developmental—the development of children. The level of toxin in their blood was something like 50 times greater than the water—those damaged by the water in Flint, Michigan. And the changes the Republicans made would have made it virtually impossible for those children to sue for compensation for the very serious injuries they received. AMY GOODMAN: So let’s go back to the other people who contributed money. At the beginning of this report, in the last segment, we talked about the Koch brothers, we talked about Sheldon Adelson. Explain what happened. I mean, I think our listeners, viewers, readers remember well 2011, when protests rocked the Wisconsin Capitol, the uprising of 150,000 people at the state Capitol as they took over the Capitol, occupied it. Police officers, firefighters, nurses, teachers, high school kids, environmentalists, union activists all slept at the Capitol night after night. Talk about what happened next with this recall campaign and the money that Walker was appealing for. ED PILKINGTON: Right. You describe well these scenes that happened there and then, extraordinary events, very, very dramatic. Even the Democratic senators fled to Illinois, if you remember, for several days. And we all remember those heady events. Scott Walker put a bomb under Wisconsin in Act 10, and it turned it, as I said earlier, into this sort of ground zero of partisan politics in the country. And in the fallout from that, he was—he and his—six of his senator colleagues from the Republican Party were put through recall elections. At that point, it kind of went dark for the public of Wisconsin, and they couldn’t follow what happened next, which was that Scott Walker’s campaign committee got together major fundraisers, political organizers, and they started fanning out across the country. Literally, Scott Walker himself made several trips down to Texas to call on oil money. He went over to New York. He did a journey one memorable day down Fifth Avenue in Manhattan, where he went to spend 45 minutes with Donald Trump. And he went to Morgan Stanley and a big law firm. And in every occasion, you see him going to visit these major billionaire donors, and a few days or weeks later, checks starting to arrive, not to his own campaign committee, but largely to the coffers of this third-party group, Wisconsin Club for Growth. And I should say, if people are interested enough in what is a fiendishly complicated world, I have to warn you, of campaign finance in America—which is, I think, part of the problem—they can themselves go in and read all of these documents. We have lightly redacted them for personal information, but, otherwise, they’re on our website. You can go in, and you can absolutely make your own conclusions from this. And you may think it’s great, you may think it’s awful, but you can do it for yourself. JUAN GONZÁLEZ: And you mention—you mention Donald Trump, whose campaign contributions are coming back to haunt him, several of them, in this campaign. What specifically happened with Trump? ED PILKINGTON: Specifically, Scott Walker went across to New York in early, I think it was, 2012. He did this tour down Fifth Avenue. The documents show a sort of calendar of his day. We have no transcript of the discussion between them, but he did spend 45 minutes—it was in his schedule—with Donald Trump in his Fifth Avenue headquarters. On that very same day, Donald Trump wrote a check for $15,000. We have the check from the documents. We post—they are among the documents you can see in the database. And, you know, in the subject line, it was made out to Wisconsin Club for Growth. JUAN GONZÁLEZ: I want to turn to a clip from the first Republican presidential debate held in August of last year. Wisconsin Governor Scott Walker was a candidate at the time, and he participated in the debate. This is moderator Bret Baier of Fox News questioning Donald Trump. DONALD TRUMP: You better believe it. That’s true. BRET BAIER: So what specifically did they do? DONALD TRUMP: If I ask them, if I need them—you know, most of the people on this stage, I’ve given to, just so you understand. A lot of money. SEN. MARCO RUBIO: Not me. MIKE HUCKABEE: Not me. But you’re welcome to give me a check, Donald, if you’d like. DONALD TRUMP: Many of them. GOV. JOHN KASICH: If you end—hey, Donald, Donald, if you end your campaign, I hope you will give to me. DONALD TRUMP: Sounds good. Sounds good to me, Governor. I will tell you that our system is broken. I gave to many people, before this. Before two months ago, I was a businessman. I give to everybody. When they call, I give. And you know what? When I need something from them, two years later, three years later, I call them, they are there for me. SEN. MARCO RUBIO: So what did you get? DONALD TRUMP: And that’s a broken system. JUAN GONZÁLEZ: That was Donald Trump at the Fox News Republican primary debate. Documents leaked in the John Doe investigation show Trump did give at least to one of the candidates on that stage: Scott Walker. And as we’ve mentioned, on April 3rd, 2012, he wrote a check for $15,000, not to Walker’s campaign fund, but to the Wisconsin Club for Growth. Ed Pilkington, this is business as usual at this stage in American politics. ED PILKINGTON: Yes, I mean, it underlines what an extraordinary presidential election we’re going through. On the one hand, you had Bernie Sanders; on the other hand, you had Donald Trump—two complete opposites politically, saying exactly the same thing, that the political system is broken, that billionaires and corporations have politicians in their pocket. In the case of Donald Trump, he said it personally; he had politicians in his own pocket. And I think that speaks to something that is of increasing concern to voters, and explains the anger that voters have, that they feel their vote is—counts less than the money that is being contributed to politicians. AMY GOODMAN: I wanted to go back to 2011. A blogger named Ian Murphy revealed he had impersonated David Koch in a recorded phone conversation with an unsuspecting Governor Walker. Murphy said he pulled the prank after learning that Walker was refusing to return phone calls from Democratic senators. During the 20-minute conversation, Governor Walker admitted he had considered disrupting opposition to his anti-union bill by planting troublemakers among the protesters. This clip begins with the blogger, Ian Murphy, impersonating David Koch. IAN MURPHY: We’ll back you any way we can. But what we were thinking about the crowds was—was planting some troublemakers. GOV. SCOTT WALKER: You know, the—well, the only problem with—because we thought about that. The problem with—or my only gut reaction to that would be, right now, the—the—and the lawmakers I’ve talked to have just completely had it with them. The public is not really fond of this. AMY GOODMAN: Well, at the time of the call, the Public Campaign Action Fund was saying Governor Walker may have violated a law that forbids politicians from coordinating with political donors. 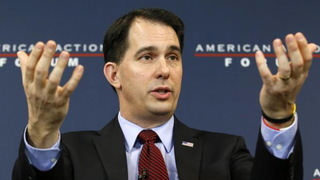 The prank phone call ended with the David Koch impersonator inviting Governor Walker to visit him in California. IAN MURPHY: Well, I’ll tell you what, Scott, once you crush these bastards, I’ll fly you out to Cali and really show you a good time. GOV. SCOTT WALKER: Thanks for all the support and helping us move the cause forward. And we appreciate it. We’re—we’re doing it, the just and right thing for the right reasons, and it’s all about getting our freedom back. IAN MURPHY: Absolutely. And, you know, we have a little bit of vested interest, as well. GOV. SCOTT WALKER: Well, that’s just it. The bottom line is, we’re going to—we’re going to get to the—the world moving here, because it’s the right thing to do. NEXTWill SCOTUS Let Investigation Continue into Alleged Illegal Fundraising by Republican Scott Walker?